Shale Gas (Part I): Energy Cornucopia's Great Fight Back? The idea that resource constraints pose a limit to growth (one version of which is Peak Oil thoery) is subject to constant attack, with economists of a neo-classical persuassion frequently leading the charge. As such, those who believe in resource cornucopia, or at least that resources pose no impediment to economic growth, deserve a close reading since the victors of this debate will define how our world evolves over the next 50 years. The world is not running out of oil—at least not yet. What our society does face, and soon, is the end of the abundant and cheap oil on which all industrial nations depend. In much of the peak oil literature, the scope for technical change in fossil fuel production is downplayed. Yet there is very little basis for this assumption: indeed, more resources have been devoted to fossil fuel technologies than renewables for some time. The development of offshore oil is recent, spurred on by the OPEC price shocks in the 1970s. Much of this is based not on exogenous discoveries, but on investment. Looking ahead, it isto be expected that there will be significant results in the new areas of unconventional gas and shale oil, and in offshore E&P. The result is that, for policy purposes, we can assume that the supply of gas is almost infinite, and there are large-scale deposits of shale oil, coal and tar sands. The earth’s crust is riddled with carbon fuels. Contrary to the peak oilers, there is no physical shortage of fossil fuels—and that’s the problem. What fatally undermines the peak-oilers’ case is fungibility and substitution on the supply and demand sides. The peak oil argument rests on limited supply and expanding demand, all based on existing technologies. The next step in unpacking the peak oil argument is to relax the technological constraints—in particular, allowing for substitution between fossil fuels to satisfy the assumed growth in demand. As gas reserves have multiplied, and as the prospect of the electrification of transport has grown, the underlying assumptions about both supply and demand are gradually being turned on their heads. Abundant gas may increasingly provide the fuel for electricity generation, which in turn may displace oil in transport. In the language of economics, we can illustrate Helm’s overall argument through the use of two graphs: one for supply and one for demand. 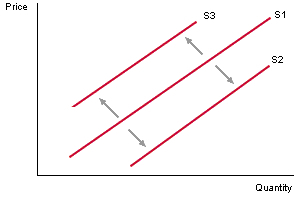 In the first, the supply curve for natural gas production moves sharply to the right, from S1 to S2, overwhelming the decline of conventional gas resources (which by themselves would have pushed the curve from S1 to S3). This is due to the development of fracking technology and other advances. In the second, we can see that technology is making sources of energy more fungible (allowing us to substitute electricity in place of gasoline). 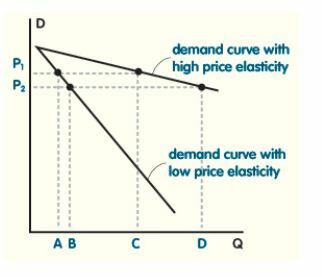 Accordingly, the long-term demand curve for oil will grow more elastic. Thus in the future, if gasoline prices go up, consumers are able to flee into electric cars (that have sourced their electricity from gas-fired power stations). Is this view of the world possible? Well yes, it is possible, since we are unable to effectively forecast the future. Is it probable (and thus should it be taken as the central scenario for policy making)? For this to be true, we must be highly confident that shale gas can grow sufficiently to, first, compensate for the decline in conventional gas in many parts of the world including the United States; second, fulfill increased demand in its traditional fields of use (heating and electricity for mostly non-transport purposes) as the world economy grows; and, third, progressively take over from oil in the transport sector. Does Helm give us a route map over how such a quantum leap in gas production could be achieved? Does he show how the explosion in electric car producion will take place? Does he reference any of the forward-looking studies by the International Energy Agency (IEA) and US Energy Information Agency (EIA) that tackle these issues? Unfortunately, the answer to all these questions is ‘no’. The assumption is that the oil price begets technology and technology begets an alternative energy supply than that provided by oil. Indeed, it appears as if Helm believes the market’s delivery of a solution is so obvious that the provision of mere data to support this proposition is regarded as entirely superfluous. I can only describe such an approach as quisi-religious. Unfortunately, the economics literature appears rife with such thinking whenever such topics as Peak Oil and climate change are addressed. Critically, the economics literature rarely if ever references the scientific literature whenever it considers such issues; the scientific literature appears another country that is not worthy of investigation. Moreover, the vast majority of articles in the press in recent months reflect this view of the world: in short, the recent media spin is that the magic of technology is on the brink of delivering a new energy saviour in the form of shale gas. So we should, therefore, all go about our business on the assumption that anyone who believes that a resource constraint could materialise is a crank. In my next two posts I will attach some figures so we can see if this proposition could be true. The first will address the question of whether there is enough gas out there (conventional and unconventional) for us to take out oil as a transport fuel. The second will address the question of whether gas generated electricity could become fungible for oil. This entry was posted in Peak Oil and tagged Colin Campbell, Dieter Helm, Jean Laherrere, Peak Oil, shale gas. Bookmark the permalink. I couldn’t find an email address for you, so I’m leaving a comment here. I’ve found your blog posts really insightful, and thought you’d be interested in a couple of projects of mine. Thanks Mason. Project sounds really interesting: I will check it out.